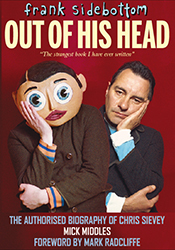 THERE HAS NEVER BEEN AN ARTIST quite like Chris Sievey or his 'fantastic' comedic alter-ego, Frank Sidebottom. Whether pushing for chart action while fronting his former band The Freshies or allowing the bombastic Sidebottom to wreak anarchy and chaos on television, radio or with the Oh Blimey Big Band, Sievey's mischievous muse seemed to obey no boundaries. Yet it was only after Chris's untimely demise in 2010 that the extent of his influence became fully apparent. The emergence of Jon Ronson's film, 'Frank', Steve Sullivan's exhaustive documentary 'Being Frank: The Chris Sievey Story' and the erection of the Frank Sidebottom statue in his native Timperley last October - before 2,000 devotees - all combined to make this the most extraordinary stories of recent decades. Yet Chris found difficulty in being Frank. The people whose careers he helped begin or inspire: Chris Evans, Mark Radcliffe, Caroline Aherne, Steve Coogan, Jon Ronson, to name a few - all went on to a achieve a degree of fame and fortune that Chris never managed. In this unorthodox biography, legendary journalist Mick Middles draws on his thirty year friendship with Sievey to gain further insight into this most charismatic of artists. Family members, fellow musicians, fans and acquaintances help trace Chris's career from Timperley to Hollywood. MICK MIDDLES is the author of 24 books, most of which have concentrated on Manchester music artists from punk to present. His work has appeared in Sounds, The Face, Daily Telegraph, Classic Rock, Classic Pop and many more. Mick lives with his wife, Vicky, in Flixton, Manchester.